Nightingales – as so many of our best loved birds – have taken a hard hit in recent times. In the last 40 years they have declined by 90% which means that where 10 may have been singing when I was young, only one is singing today. So when a friend told me he had never heard a nightingale, I thought we had better put that right quickly before we lose them altogether. The corn bunting and the grey partridge may not have the nightingale’s ‘full-throated ease’, but they do most certainly ‘sing of summer’ and they too have declined by 90% since 1970. Later on Sunday evening we wondered around the countryside behind Addenbrookes Hospital listening to them. Our City Council is keen to build on green belt and threaten the habitat of these quintessential farmland birds and last night I spoke to the council’s ‘Planning and Development Scrutiny Committee’ to encourage them to think again. It was a disappointing meeting – the committee members seemed to regard the occasion as an opportunity to proof-read the local plan and discuss minor points of detail, rather than to debate points of principle and ask the civil servants to find better solutions. The reply to my own statement was ill-informed. It was not a good advert for democracy. Of course people need places to live – but so does wildlife and we need to do a better, more imaginative job of reconciling our own needs with those of our companions on this planet. It would be criminal if future generations were unable to hear the ‘light-winged Dryad of the trees’ or his arable counterparts. This entry was posted in Music, Nature by user29464. Bookmark the permalink. Loved your piece about the nightingales, John. And I loved to your gentle-spirited reverence not only for the birds (our companions, as you so beautifully put it) but for the poets who have praised them. As it happens, I too attended a meeting with the Council recently about a high-density development currently proposed for a densely populated (and hence deforested) area of Cambridge. Inevitably there was no opportunity to discuss the effects of this on the struggling bird-population, or the effects on the human psyche of losing yet a little more companionable communion with wild creatures who share our patch of earth. But such grumbles are part of the process of change. Only a couple of decades ago, eco-campaigners could easily be marginalised as cranks! 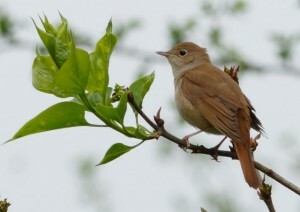 Thank you for your blog and for including the nightingales’ songs among your own!